User Centred research and analysis working within Agile workflows. The Met Office is the United Kingdom’s national weather service, providing weather and climate-related services to the public, civil aviation, the Armed Forces, shipping, industry, agriculture and commerce. Embedded with various Met Office teams at main headquarters, Exeter over a 9 month period to provide User Research and UX/UI design for a range of government commissioned, public sector projects. Initial project involved scoping the re-design of a new ‘mobile first’ version of a web based weather app for the aviation industry (for delivery 2018). 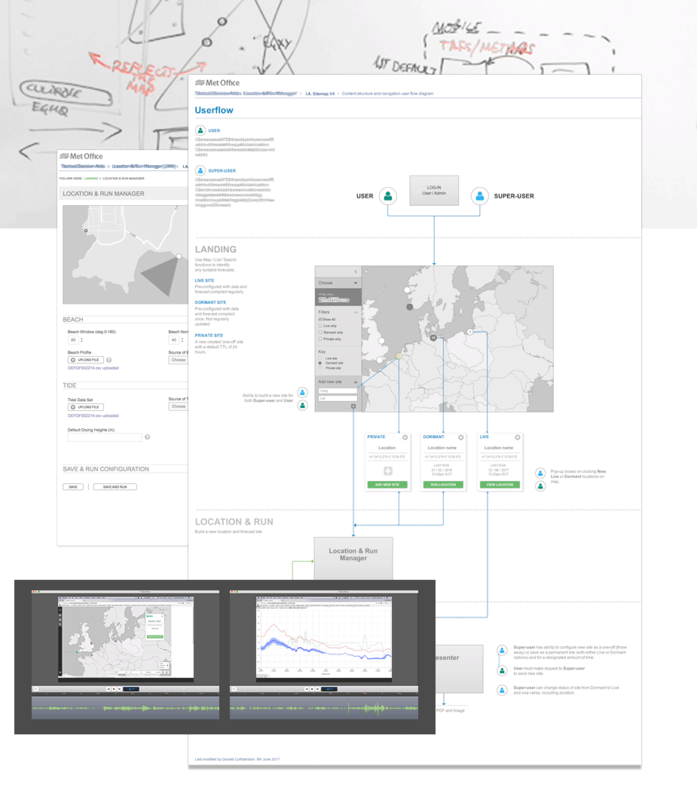 Produced wireframes (I.A) to map out proposed navigation and content structures for mobile. Set up an online style-guide to organise and store all graphic assets and associated front-end code for the app. Defined internal usability testing procedures. 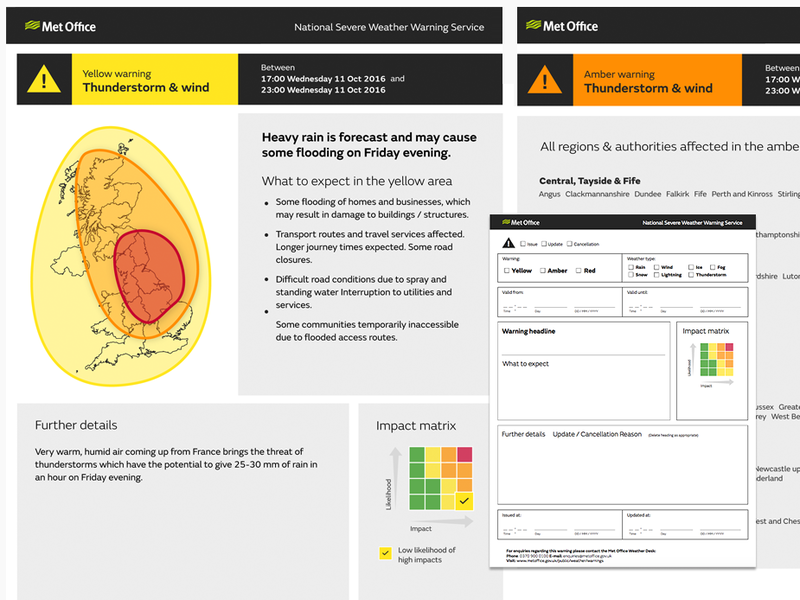 The style-guide and additional work on an overall Design System has subsequently been recommended for wider development across the entire Met Office range of products. Initial work with Product (project) Owner involved defining the specific user-archetypes for the app and then mapping out and prioritising the use cases for each user-archetype. Primary / secondary user flow wireframes were produced from this initial work and presented to internal / external stakeholders (meteorologists) for feedback. An interactive, high fidelity prototype was developed (in Axure) on the basis of initial user feedback and a series of internal usability test sessions were set up to test the new interface and access to content. The product was iterated a number of time through the user testing phase and all test sessions (A/V recordings) were documented and presented online for reference. Test outcomes were finally presented to the external development company along with the interactive prototype to begin final production of the app. The process of research / discovery, prototyping and design iteration resulted in efficiencies both in design and development which marked a departure from the first version of the app. Designed an ‘off-line’ backup template for NSWWS team to be used if the main web site that produced the online weather warnings was not operational. This project involved visiting Local Resilience Forums (Devon/Cornwall) to talk to first line responders and emergency (‘blue light’) services about their requirements for the proposed PDF document including how best it should be disseminated. 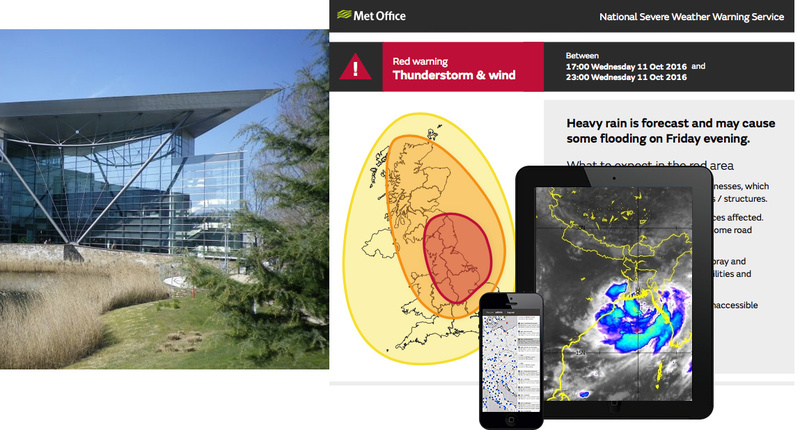 Based on these requirements and also working with Met Office meteorologists specification a template system was designed that clearly detailed the severity of the weather warning and all the required ancillary details. The final design was coded in HTML which was integrated with the Met Office system for producing PDF documents ready for for sending out to all front line responders. Carried out Stakeholder research for a new Cloud (AWS) based, internal facing Met Office API portal. The Portal project spanned a number of internal departments and external suppliers. Key personnel (12) were identified and interviewed either individually or in group discussions and ranged from Developers / Tech Leads to Information Architects and Executives. Stakeholder sessions focussed on project vision, end users, product processes and workflows. All research was compiled with final audio/video and written presentation of findings. Final report surfaced both inconsistencies in assumptions and approaches towards the final user / customer as well as validating or reinforcing the fundamental business objectives behind the API Portal project. The stakeholder sessions helped to inform and contribute toward a subsequent re-alignment of the short and long term goals for the project both commercially and from a technology point of view – helping to define the production strategy within the internal development teams involved. Finally created a series of supporting I.A wireframes mapping out primary user journeys and site architecture.